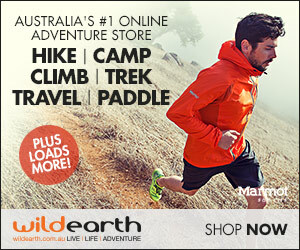 Readers to this website will know that we love sharing camping gear and gadgets that are new on the market. Or even some items which are still in the ideas stage, and not yet up and running. 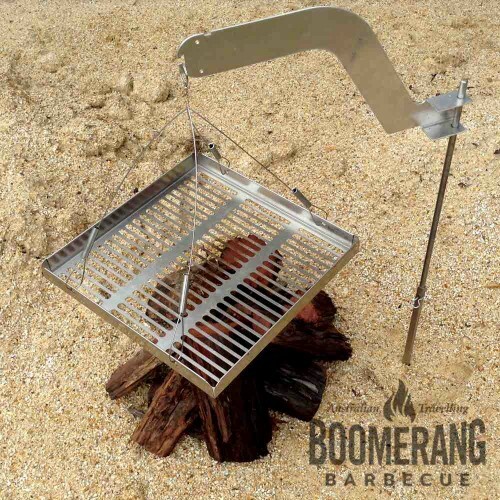 One such product that is on the market is the Boomerang BBQ, an item that many campers who love cooking over a campfire can appreciate. 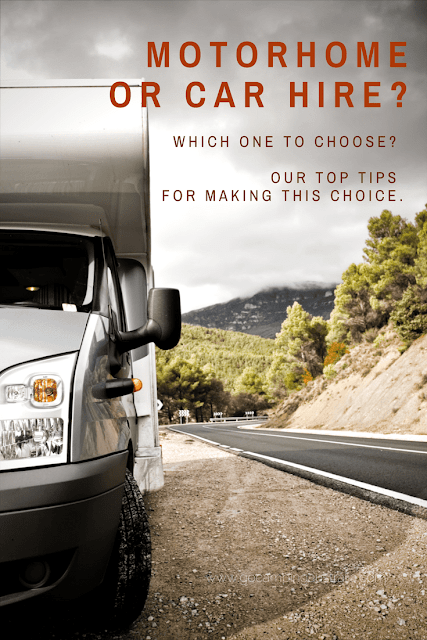 The following is a guest post by Rob, from www.campertrailers.org. who is going to share his own knowledge and experience with the Boomerang BBQ. 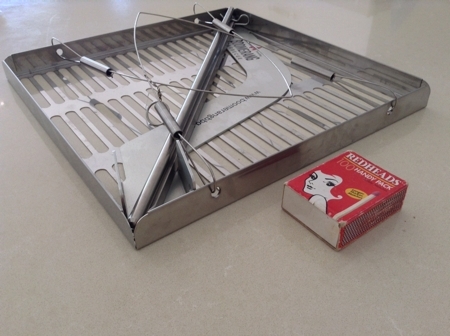 I had the opportunity to drop in on longtime CamperTrailers members Peter Schultz and Wendy Donovan who are marketing the uniquely designed Boomerang BBQ, a portable compact camping BBQ designed and manufactured in Australia using quality 316 stainless. 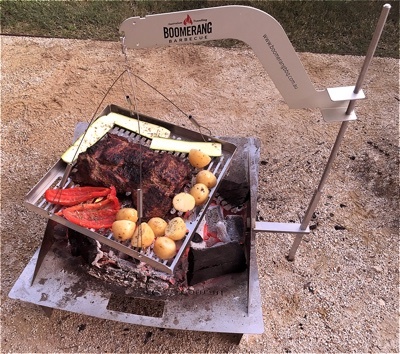 The Boomerang BBQ only takes half a minute to set up, first hammering the two piece pole into the ground, sliding the boomerang arm over the pole and then attaching the bbq plate. Adjusting the heat is a simple matter of moving the plate up and down or swinging it around. The carry bag is 330mm square while the whole package weighs only 1.7kg. 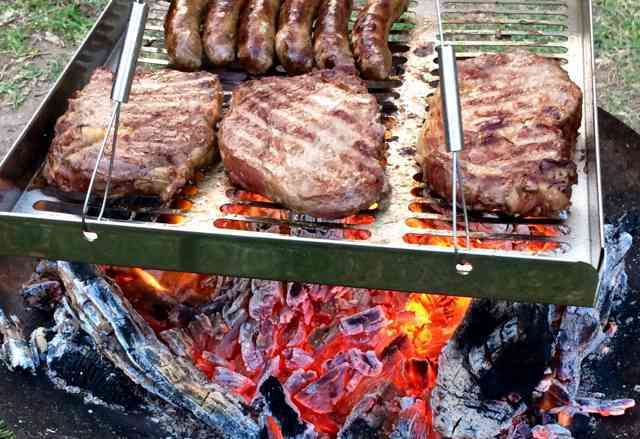 The genesis of the Boomerang BBQ goes back to 1958 when adventurer, fortune hunter and prospector, John Carr, was looking for a better way to cook over his campfire in the Central Australian desert and the jungles of Kakadu. He was sick and tired of lugging a heavy cast-iron BBQ plate around the country from camp to camp. He was also fed up with getting burnt food all the time, because he had no way of regulating the temperature over the flames of the campfire and thought there must be a better way. Over the next 22 years, John improved on his original ideas and finally won an inventors award on a 1980 Australian TV show, "What'll They Think of Next". With the prize money he went on to commercialize the barbecue, known as the CarrBQ. More than 8000 CarrBQ's have now been sold throughout Australia, Africa and USA. About 15 years ago Peter and Wendy stumbled across the Carr BBQ. They loved it so much, it became the prototype to further develop together with John Carr. Since then, it has since been redesigned, evolving into the Boomerang BBQ in 2015 (patent pending) with many additional improvements. We thank Rob for sharing this information with us. 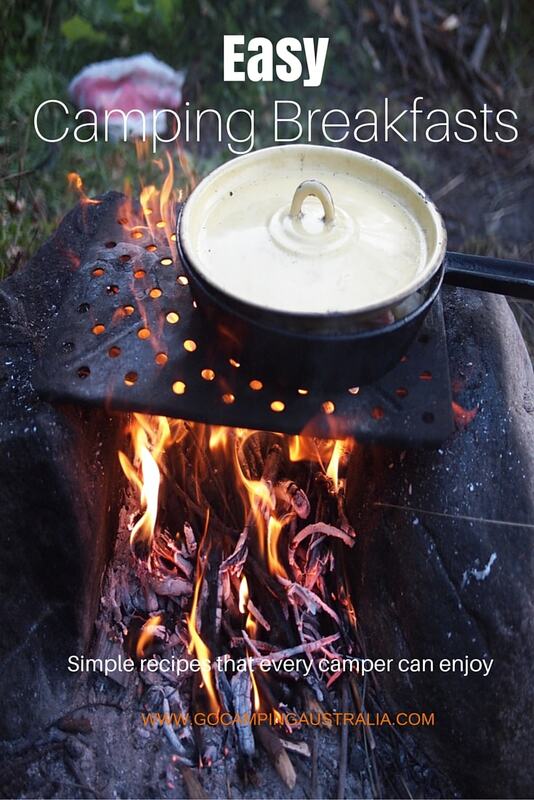 To read more stories by Rob, and loads of camper trailer information, head to the website campertrailers.org.